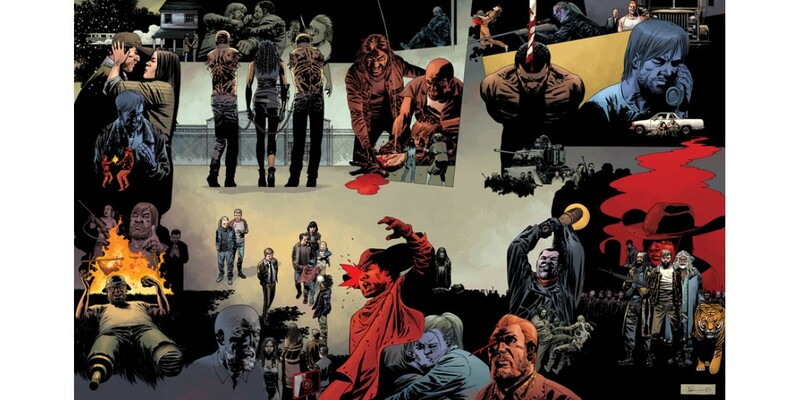 This October is the 10th anniversary of THE WALKING DEAD and we’re excited to announce that in celebration, issue #115 will have 10 connecting covers. The covers together will form an image that highlights significant moments from the past 10 years of the series. Each of the 10 individual covers will also depict a special moment from a year of THE WALKING DEAD’s illustrious history. These covers are drawn by series artist Charlie Adlard, with colors by Dave Stewart. Each weekday for the next 2 weeks, we’ll reveal a part of the connecting covers for issue 115. Our tenth and final cover is all about year eight. The safety of the Alexandria Safe-Zone is threatened and Carl is gravely wounded but Rick finds new hope for the future.